2.6m height• Flash lights on eyes, chest• Voice changer is included• Production time: around 1 month• Material: High density EVA foam, car paint, metal etc.• 100% handmade• Full body armor set includes: helmet, shoulders, arms, hands, chest/back, waist, thighs, legs• Color : lifelike or customizedFeatures & Advantages of Transformers Bumblebee CostumeFlexible activityThe Transformer bumblebee costume consists of a number of different body parts that are connected by Velcro, screws, and the like. The performer inside it who can walk easily.Professional WorkAll handmade workers who has more than three years of experience in Transformers bumblebee costume hand-made. 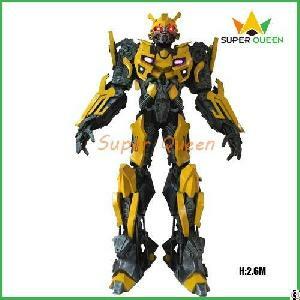 The Transformer bumblebee costume design is based on 3D figures.Durable and SafeThe stilts of Transformers bumblebee costume are made of aluminum alloy.MoreThe Transformers bumblebee costume with lights on eyes, chest, and lights around the armor. It with voice changer to make the costume like a real robot. The custom requirements are acceptable.